On this Sunday dedicated to the missions, the parents of the patroness of missionaries -- the "Little Flower" Therese of Lisieux -- were beatified together this morning at their daughter's French shrine. 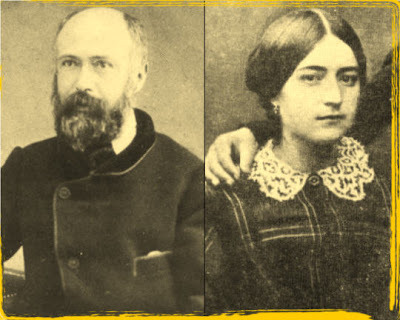 This Sunday in the basilica of Lisieux, Louis and Zélie will be beatified, the Catholic church's final step before canonization, positioning them to join the rarefied company of saints who were married. That brief list includes Saints Peter, Monica, Thomas More and the American-born Elizabeth Ann Seton. The roster of saints married to one another is even shorter: Isadore and Maria, 10th-century Spanish farmers, are among the few. The Lisieux ceremony follows the Vatican's approval, in July, of the required miracle -- the healing of a man with a malformation of the lung. But the beatification raises questions about the models of life being presented to Catholics. What can a man and woman who planned to live celibately say to married couples today? The two traditional roles of the saints are the patron (who intercedes on behalf of those on earth) and the companion (who provides believers with an example of Christian life). And the paucity of lay saints -- more specifically, married ones -- in the roster is somewhat embarrassing. Two reasons underlie this anomaly: the outmoded belief, almost as old as the church, that the celibate life was "better" than married life, and the fact that the church's canonization process is an arduous one, requiring someone to gather paperwork, interview contemporaries if that is still possible and present the case to the Congregation for the Causes of Saints. Certainly there have been as many saintly wives and husbands as there have been holy priests and nuns. But religious orders and dioceses know how to navigate the canonization procedures on behalf of bishops, priests, brothers and sisters. By contrast, how many families have the resources to embark on the decades-long process on behalf of even the holiest mother or father? As a result, married Catholics have few exemplars other than Mary and Joseph, whose situation was hardly replicable. Since the Second Vatican Council, which emphasized the "universal call to holiness," Rome has stepped up its efforts to canonize more lay and married people. The Vatican hopes to expand the "calendar of saints" beyond those who sport miters, collars and veils in order to provide Catholics with lives that they can emulate, not simply admire. But do Louis and Zélie fit the bill? No one doubts that the Martins led the traditional life of "heroic sanctity" required for sainthood. Though obviously biased, St. Thérèse wrote: "The Good God gave me a father and mother more worthy of heaven than of earth." They were devoted to one another, to their children and to their faith. During their first year of marriage, the couple took into their home a young boy whose mother had died. And whenever Louis and Zélie were apart, they exchanged the tenderest of letters. "Your husband and true friend who loves you forever," Louis wrote. One lesson that believers might take from the new "blesseds" is that sanctity comes in many styles. If it were up to their youthful selves, neither would have married: Zélie wanted to be a nun as much as Louis hoped to be a monk. After setting aside their celibacy, they provided a warm home for their children, five of whom fulfilled their parents' thwarted hopes for life in a religious order. The wife died early; the grieving husband struggled with mental illness, including hallucinations in which he saw "frightful things," according to his daughter Céline. Throughout their complicated lives Blessed Louis and Zélie Martin tried to love as best they could, something that is still relevant -- and not just to married couples. And whose life, and which saint's life, is "typical" anyway? Holiness, as the lives of the saints remind us, always makes its home in humanity. Elsewhere, the folks at the Good Deacon's place got the scoop on the new blesseds as their Sunday homily... and even TIME gets into the act with a package of the "Top 10" -- OK, 12 -- causes in the pipeline. "A Country Drenched in Blood"